Travelling in Spain and other Spanish speaking countries can be that much easier with a knowledge of a few Spanish words. Being able to ask directions confidently, find out times of buses or trains and book tickets can make all the difference when travelling. This is useful vocabulary whether travelling for business, planning a short city break or about to embark on a long family holiday. Visitors to Spain have three main options when it comes to travel, assuming that they do not wish to hire a car. The main forms of getting around the country are by bus or train. There is also the option of air travel and there are many local and national airports around the country. While English is spoken at many of the larger bus/train stations and airports, this isn't necessarily the case at smaller or local stations or airports. This needn't be a problem, however, as a few words are all that are required to successfully book tickets and arrange journeys. Do you go to…? - ¿Va usted a…? Where can I buy a ticket? - ¿Dónde puedo comprar un billete? How much is a ticket? - ¿Cuánto es un billete? Do you speak English? - ¿Hablas Inglés? Travelling in Spain is relatively straightforward. A lot of preparation can be done from home before travelling. 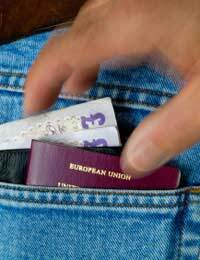 Tickets, for instance, can often be purchased online or from a travel agent before travelling. Many large Spanish towns and cities have websites that include information about travelling to and around the area. This often includes specific information about local buses and trains. Some larger stations have automatic ticket machines where tickets can be purchased by credit card to a variety of other stations in Spain. While the names of many Spanish cities are the same in English and Spanish, this is not universally the case. Remember to use the Spanish names for cities such as Seville (Sevilla in Spanish). If a traveller isn't confident about asking for tickets and other information in Spanish then a useful tip is to write down the question or request. This is particularly useful in busy situations or when time is short. It also reduces the potential for misunderstandings to occur. Small maps are useful to carry around. When asking for directions people can demonstrate on the map and this is easier to remember than listening to directions in an unfamiliar language. Print out or write down important travel phrases and carry this with other travel documents. This is useful for a quick reference guide.